We will assist you with obtaining a Schengen visa. Ask for help - we would love to assist you. Experience the beauty of the Mediterranean on one of the MSC luxury cruise liners by booking an international cruise. You can choose between cruises departing from Barcelona, Istanbul, Venice, Lisbon and Genoa to name a few (Venice is the most popular). Check availability by filling in the MSC Mediterranean Cruises form below, or email cruises@southafrica.to or phone 021-531-7453. Please note pricing on cruises is dynamic and is changing daily. Please contact us for the most current price. Tip : if you're looking for ultra cheap cruise rates, select to cruise from January to March. If you would prefer not to share one cabin, please indicate the number of cabins you require. Cabins on the Sinfonia sleep a maximum of 4 people. Are you 60 years or older? If yes, how many adults are 60 years or older? Please put the city from which you would like to fly in the "Special Requests" field and the number of nights of accommodation that are required in the "Special Requests" field. Are you an MSC Voyagers Club Member? MSC does not provide kosher meals as part of its regular service, and these need to be ordered well in advance of the cruise (check with your consultant exactly how much notice is required). MSC Mediterranean Cruises are rated 4/5 based on 1 customer review. 27 Sep 2013 : The MSC Musica becomes the first cruise ship to use Constanta in Romania as an embarkation point. Whilst cruise ships have stopped there before, it has never been to pick up passenger. The passengers will cruise from Constanta to Cythion, Venice (Italy), Katakolon, Istanbul (Turkey), Yalta, Odessa and then back to Constanta. The following MSC cruise ships are regularly in the Mediterranean: MSC Armonia, MSC Musica, MSC Sinfonia, MSC Preziosa, MSC Fantasia, MSC Lirica and the MSC Splendida. Venice - Brindisi - Olympia - Santorini - Athens - Corfu - Kotor - Venice. Here's a review of an MSC Musica Med cruises, starting in Venice. Venice - Split - Santorini - Mykonos - Dubrovnik - Ancona - Venice. Think history, off-road villages and forests mountains rising above the seas. All the above ships are great choices for Mediterranean cruises - the main choice is to decide if you want to go for a western or eastern Med cruise. Currently there are no Mediterranean Package deals, but keep an eye on this page for more specials during 2017/18. *The longer the time since the date the offer was published, the greater the chance of prices having changed. MSC Cruises offers year-round cruises in the Mediterranean. 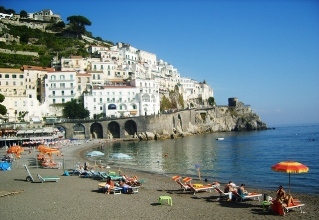 Being an Italian company, they are extremely well versed with the area and offer a wide selection of ports to visit. Immerse youself in the culture and history or try an exotic meal. There is so much to explore, see and do, all from the comfort of an MSC cruise ship. Choose from one of MSC's fleet of 12 ships for your unforgettable Mediterranean cruise holiday. This bucket list destination is one of the most romantic destinations in the world. If your cruise starts or ends in Venice, be sure to book at least a few days accommodation there. Enjoy a leisurely stroll along the town's cobble stoned streets while you indulge in real Italian gelato. 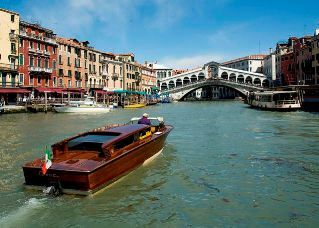 Hop on a gondola ride with your loved one and view the city from its network of canals. Visit the Doge's Palace (go on the Secret Itineraries tour), and hop onto a boat to Murano and see how they make glass ornaments. Here's a video of an MSC Musica cruise in the Eastern Med, starting in Venice. Book a shore excursion to the Italian Riviera town of Portofino during your stop in Genoa. This fishing village is famous for its picturesque harbour and is a popular resort for celebrities. This port is close to the city of Rome. View the ancient city of Rome which is still standing in ruins today. Take in all the history that this city has to offer by visiting the Colosseum, the Vatican City and the Forum. This Spanish city is famous for its architecture, much of it from medieval times. Learn to dance the flamenco, sip on fruity sangria and snack on tapas while you enjoy all the culture that this city has to offer. This port is close to Nice and Monte Carlo so passengers can book a shore excursion to explore one of these breathtaking French towns, or relax on hte beaches, soaking up the sun in the French Riviera. Istanbul has been described as a city of east meets west, with influences from both Europe and the Middle East evident in all aspects of the city. Enjoy traditional Turkish meze and Turkish delight while you enjoy the beauty of this unique Mediterranean city. Marvel at the traditional blue and white architecture to be seen on this magnificent Greek island. 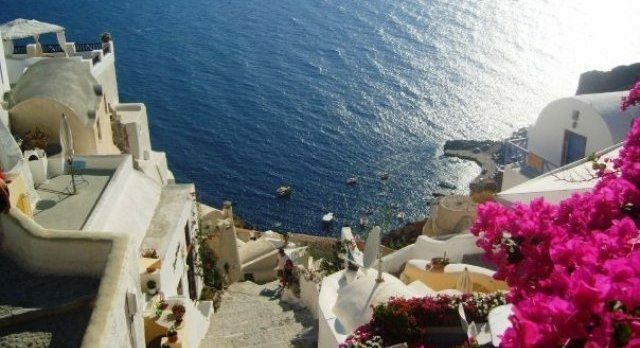 Enjoy dolmades, gyros, souvlaki and baklava while you stroll around the streets of Santorini. Youtube clip from an MSC Musica cruise to Santorini, Kotor, Venice and Corfu. Often on Med cruises, the only visa you require is the Schengen visa, which is relatively easy to obtain. Ask one of our friendly agents to assist you in getting your visa. There are also Royal Caribbean Mediterranean cruises; as well as Holland America, Cunard Line, Norwegian Cruises, Crystal Cruises, Celebrity Cruises, Princess Cruises and Carnival Cruises.